Sophie & Clementine qualified for the Wadswick Grassroots Dressage Championships at Badminton House in July 2014, in a large and strong field of ponies. Find out how they got on! Liver chestnut mare aged 10 bred by Vanessa Parkinson. Sire: Denburydown Democrat. Dam: Stourton Chloe. 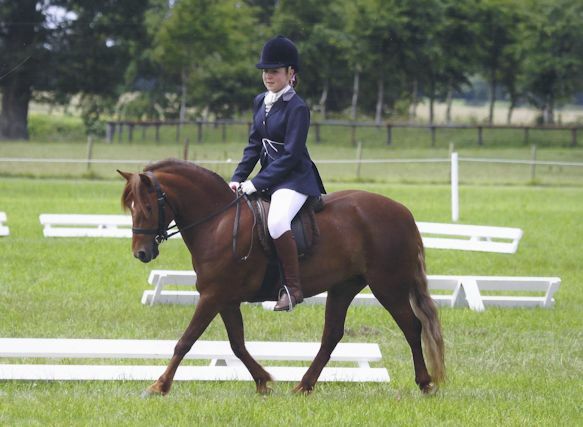 Sophie Raggett bought Clementine as a 4 year old and in the past six years Sophie and Clementine have competed in mostly Working Hunter and Dressage. Sophie & Clementine qualified for the Wadswick Grassroots Dressage Championships which were held at Badminton House in July 2014, they finished 8th in their Novice Test and 25th Overall in the Championship class in a very large and strong field of ponies, Clementine being the smallest and only Dartmoor on that day to compete at the Championships.